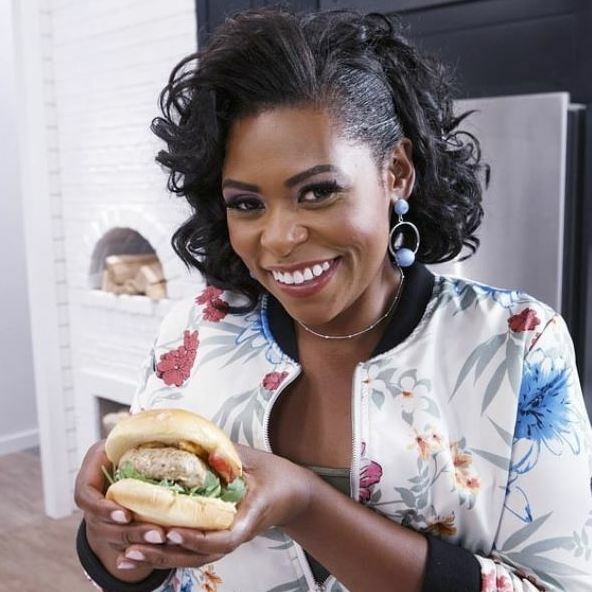 Celebrity Chef Jamika Pessoa is one of the fresh, new, and popular personalities on the Food Network. The executives at the Food Network agreed and tapped her to be a regular contributor on the show Best Thing I Ever Ate, and to serve as a judge on several popular Food Network show like Clash of the Grandmas, Chopped Jr. and Ultimate Summer Cook-off. Chef Jamika is currently lighting up the screen in a brand new Food Network endeavor. The most exciting part of the new project is that it’s on a screen that is as close as your smart phone or tablet. The new show is called Let’s Eat. 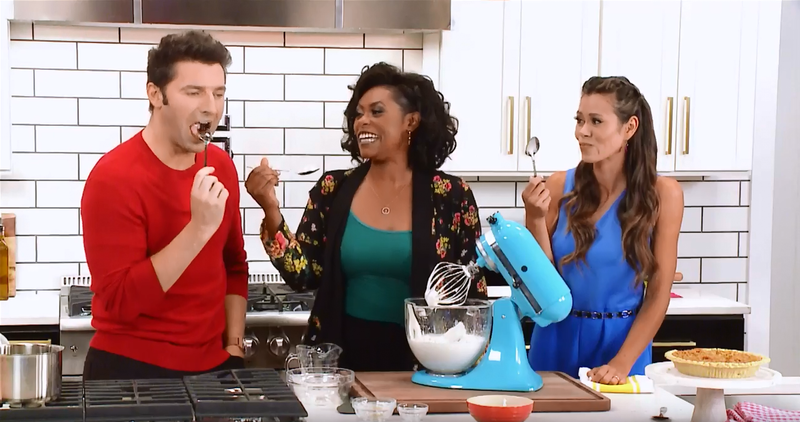 Chef Jamika shares co-hosting duties with food and lifestyle expert Brandi Milloy, and celebrity and professional chef Stuart O’Keeffe. Let’s Eat is a 13-episode Food Network app digital series which takes a contemporary and sometimes whimsical look at food from the hosts’ point of view and through the lens of social media. 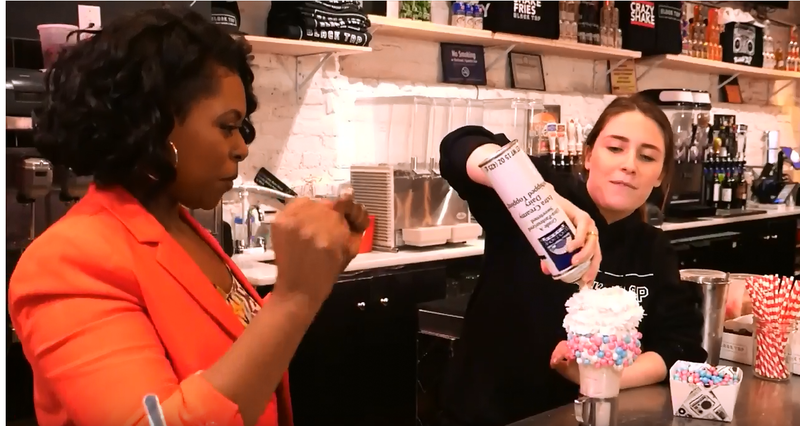 The recipes are original creations developed by the hosts and the show also features the latest food fads, restaurant tends, and time-saving food hacks. Each episode has lively interaction between the hosts which make viewers feel as if they are cooking right along with them in the kitchen. On the Let’s Eat set. From left to right: Celebrity and professional chef Stuart O’Keeffe, Celebrity Chef Jamika Pessoa and lifestyle expert Brandi Milloy. Photo credit: Food Network Youtube Channel. The look and feel of show inarguable attracts millenniums, as it showcases trendy dishes and encourages social media engagement. But it truly targets an audience that have come to rely on their hand held digital devices, along with a array of apps, for on-demand content in their 24/7 lifestyles. That audience includes, well – most of us. Let’s Eat meets that need and provides engaging content and recipes that are simple to make and on the table without a lot of fuss. Chef Jamika’s Blue cheese, aged rib-eye steak. Photo credit: Food Network app. 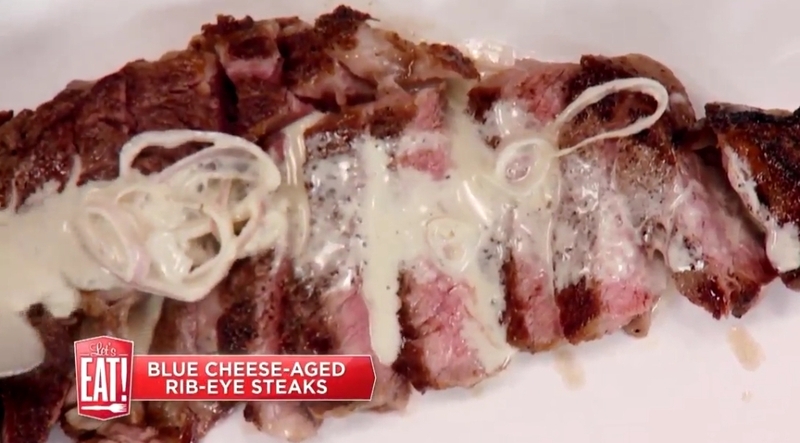 In episode 1, Chef Jamika wowed visitors and viewers with her impressive, droll-worthy, blue cheese, aged rib-eye steak. She infused aged steakhouse flavor into the rib eye with a surprising food hack people are still talking about. Left: Parmesan crusted chicken tenders. Right. Chicken tenders transformed into Chicken Picatta. Photo credit: Food Network app. In episode 9, she dazzles us with her “kiddy plate to dinner date” recipe. In this show she makes Parmesan crusted chicken do double duty as chicken tenders for the kids, and Chicken Picatta for the grown-ups. It’s undeniable that Chef Jamika brings a lot of style and grace to the show. Her effervescent personality and clever one-liners make her the life of the party. Her makeup and wardrobe are on point and add to the brilliance of her personality. Chef Jamika on the set of Let’s Eat. Photo credit: Instagram @chefjamika. Living in her truth and embracing her personal style and culinary perspective is something Chef Jamika is very comfortable with. She admits it hasn’t always been that way. She says time and experience have been the best teachers. “I’ve learned over the years that once you get to that point when you know who you are and what you bring to the table, you have to be confidant and stand in your own truth,” said Chef Jamika. It’s this very attitude that has made her one of the Food Network’s most popular celebrity chefs. 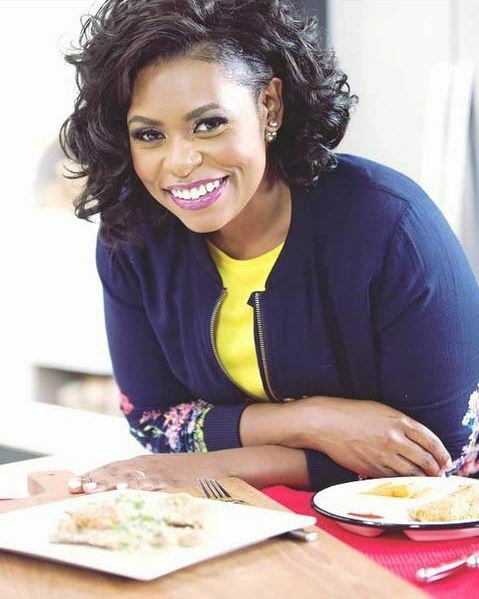 Let’s Eat gives visitors and viewers a chance to see her passion for cooking and her cheerleadering spirit. Chef Jamika on location, trying out a new food trend. Photo credit: Food Network Youtube Channel. Let’s Eat has a little something for everyone from appetizers, desserts and entrees to the most Instagramable foods. And Chef Jamika says that if visitors and viewers make one of her recipes and tags it #letseat, she just might will give them a shout out. 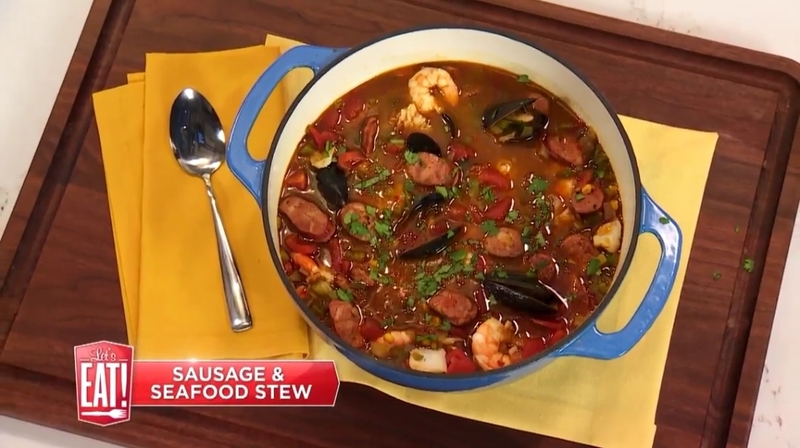 Chef Jamika shares her Quick Sausage and Seafood Stew recipe from episode 11. This tasty, hearty stew looks like it takes all day to make, but its on the table in just under an hour. Make sure to check out all the episodes on Let’s Eat, which can be viewed by downloading the Food Network app from iTunes and Goggle Play. From the Food Network app just type Let’s Eat in the search bar and get cooking. Recipe credit: Chef Jamika, Food Network app. Heat the olive oil in a large stockpot over medium heat. Add the sausage and saute until beginning to brown, 3 to 5 minutes. Stir in the onions, celery and bell pepper and cook until translucent, 3 to 5 minutes. Add the garlic and saute for 1 minute. Add the tomatoes, corn, Worcestershire sauce and red pepper flakes and cook for 2 minutes. Add the broth and 2 cups water and bring to a rapid boil. Reduce the heat to a simmer, cover and cook for 8 minutes. Season with salt and pepper. Add the fish and seafood to the pot and stir well. Cover and cook just until the shrimp are opaque and the mussels are open, 2 to 3 minutes. Stir in the cilantro to finish. Serve the stew in bowls garnished with additional cilantro. If serving with rice, spoon about 1/2 cup cooked rice in the center of each bowl first, then top with the stew. Make this dish more or less extravagant by adding higher end seafood or lower end frozen seafood. This stew is great served with toasted garlic bread. Quick Sausage and Seafood Stew. Photo credit: Food Network app.